With half a decade since the 2008 financial crisis, a far more distressing crisis has emerged among all the proposed reform strategies, austerity measures and jagged-edged line-graphs: a crisis of imagination. On one hand, this is rather surprising seeing as how much creativity it took to get us into this plight. From the decoupling of the dollar with the gold standard in 1971, to a situation where even negative value (debt) generates profits in excess of our wildest dreams–to a layperson such as myself, this is an achievement of alchemist-like proportions. Just as currency was becoming an object of speculation (and not just a tool of equivalence), the first academic journal of finance economics emerged in 1974,(2) paving the socio-economic road we occupy today. That the ideas and spirit of the finance economics endemic to the neoliberal revolution, were birthed in academia, should give us pause against the many critics who suggest the university is an elitist tower at a gaping distance from ‘lived’ life. This is not to say that ideas floating about alone in specialist journals are the impetus of popular change, but that every novel transformation of our condition is rooted in thought, more crucially, the experience of thought and it’s incorporation into a localisation or a ‘doing’. (3) Thoughts carry potency, and without resorting to utter discursive constructivism, when it comes to the contingency of socio-economic order, organization of peoples, exchange, distribution, technology, communication, logistics and goods, there are countless possibilities to be tested (and presuppositions as to the nature of existence to be contested). The successful uptake of the financialization project testifies to the potency of enacted thought: ideas and ideals launched in a mountain village in Switzerland(4) and functionally modelled in Chicago, have come to shape our everyday condition on a global scale. The self-fulfilling prophecy of financial models, evidenced by Donald MacKenzie’s analysis of the incorporation of the Black-Scholes-Merton model of efficient pricing upon the development (and ‘legitimacy’) of the Futures Market(5) points to the performative requirement (or positive feedback) underpinning the propagation of ‘fictitious capital’. Marx’s now infamously prophetic turn-of-phrase, fictitious capital is where value takes on properties beyond what can be realized in the commodity form (like credit, shares and debt), and is, in part, why those who write under the rubric of ‘cognitive capitalism’ often diagnose our situation as entirely linguistic, meaning that it, like language, refers to nothing other than itself(6) in a logic of recursivity. (7) It is the sort of potential embodied by the premise of recursivity, that drive MacKenzie to the open question at the end of his book: “What sort of world do we want to see performed?” (8); to Arne de Boever’s call for a “reclaiming of fiction within financial culture” where ‘sign-practices’ are a primary site of action in a semio-capital world(9); to the Accelerationists who call for the creation of an alter ‘intellectual infrastructure’ as a counter Mont-Pèlerin Society in their manifesto (along with institutions and economic protocols) to cope with the cataclysmic socio-ecological condition that we are currently facing. (10) Beyond the internal debates amongst these positions, which are plentiful, what becomes apparent is the urgent need for other modes of organisation, a logic of and for a new world. These calls urge us, and provoke us towards the future (and not Futures! ); they seek to affirm the creation of novel structures of cohabitation, rather than inhabiting a purely critical space (negation with no alternative); or escapist tactic (solipsistic retreat); or merely aiming at throwing a wrench into the cogs of the machinery (sabotage), they demand much more. They ask of us not to rest on diagnostics alone concerning our contemporary plight, but propel us to speculate on what does not yet exist, to speculate on the inexistent – an imaginative force of the most rigorous and courageous sort. 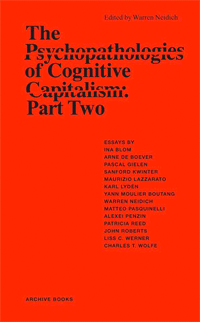 Patricia Reed, "Logic and Fiction: Notes on Finance and the Power of Recursivity" in The Psychopathologies of Cognitive Capitalism Part Two, ed. W. Neidich, Berlin: Archive Books, 2014.